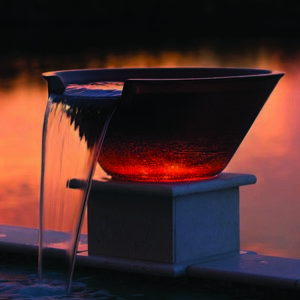 Sculpted from a durable, UV-resistant material, the Pentair MagicBowl Water Effects with FireFX LED lights is an attractive addition to a poolscape. During the day it is a water feature and at night it resembles a flowing bowl of fire. A variety of bowl shapes and metallic composite finishes are available. Colours include Bronze Finish, Silver Finish, Copper, Brass, White, Grey and Natural. It is available in a round or square shape. The bowl’s safe and efficient LED lights change and flicker with no dangerous flames or fuel. 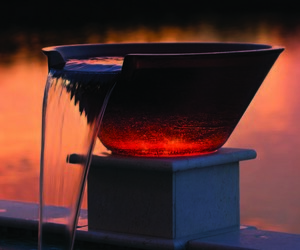 Its low-voltage LED lights and low flow requirements allow for multiple fountains and symmetry. The product can be used as a stand-alone water feature but is also automation-compatible, allowing integration with other pool and spa features. I am interested in Pentair MagicBowl Water Effects water feature .